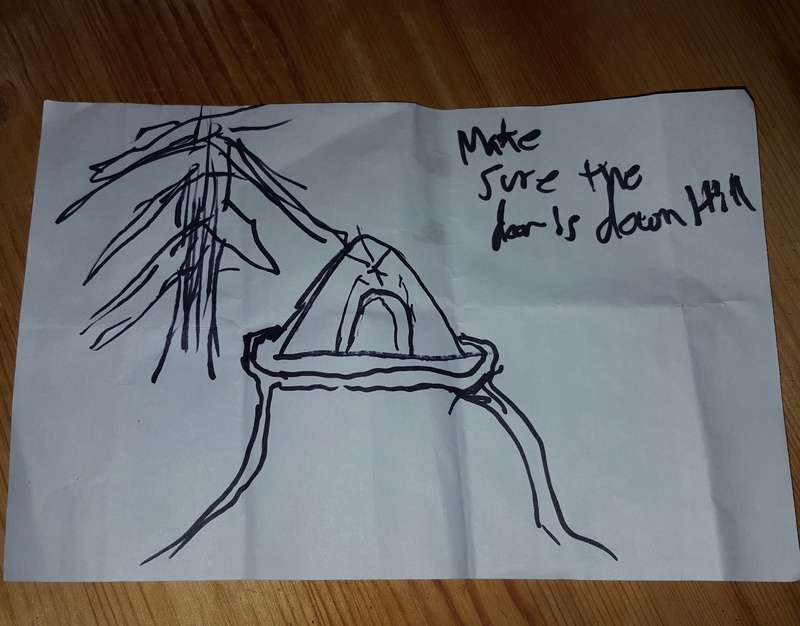 One of my friend’s drew this for me at work. I will hold it near and dear for the next couple of weeks! As luck would have it, the zipper on my Coleman Sundome 2 Tent, literally fell apart 3 days before I had to leave. I don’t think it was actually sewn on properly, It didn’t get stuck, I didn’t tug it, and I had used it less ten 10 times. Luckily, I practiced in my Backyard first!! With 3 days til I had to leave, I didn’t call Coleman, I handled it through Amazon where I bought it, got a new tent in 2 days, and don’t have to return the old one for 30 days. I set up the new tent, inspected the zipper closely and it looks much better than the old one. My friends who use this tent have assured me that this must be a manufacturing defect, as they have used theirs for a few years with no zipper problems. Only one other reviewer had the zipper fall apart. It will be in the back of my mind now, and if I buy a new tent, I will really look at the zipper. 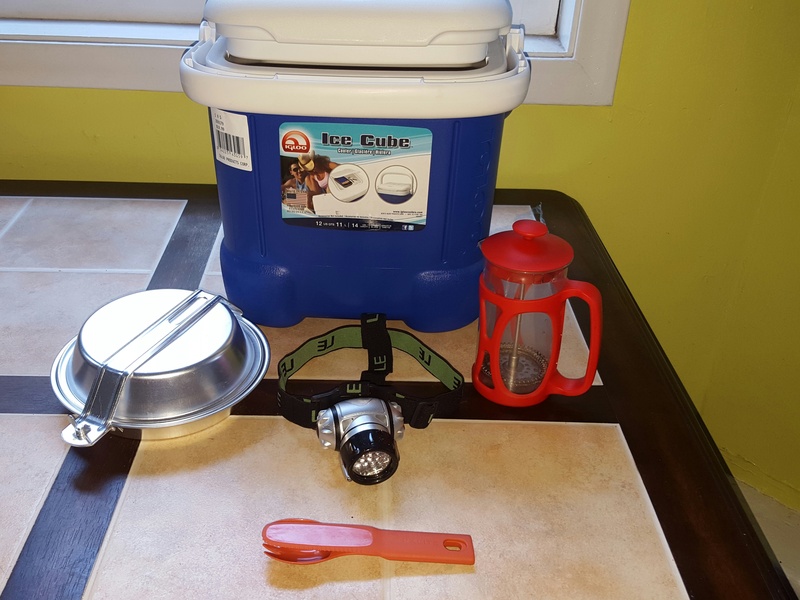 So besides the budget Coleman Sundome tent and the sleeping bag in my previous post, I picked up a few more budget items for our trip. And it all started with wanting to have my own awesome Cole Coffee while away–I’ve learned from past mistakes, there is nothing like Cole Coffee anywhere I have traveled. Lets see how my items hold up! Mini Groche French Press and Tea Maker (350ml) — $11.50. I love my Bodum 8 Cup French Press, but decided that there was no way it would survive on the road. After reading several fantastic articles about Cowboy Coffee and ultimate backpacking coffee, coffee that would require me to spend at least $25 in items to make it, I decided to go with what I know, and got this Mini French Press. The screen thingy didn’t seem to have great suction at first, but after I put the hot water in it does. Makes just enough for my Thermos, or large coffee cup. Coleman Aluminum 5 piece Mess Kit – $9 I had one of these years ago, and found it light and easy to pack. It sticks so I got some pam, though I think I will mostly use it for boiling water. I am borrowing a Coleman 2 burner stove, which some people say heats up way too fast, but hey, I’m just going to be boiling water…maybe make a grilled cheese. There are other items that I would like to try, but they are much pricier, and I should make sure that I still like camping, or camping alone, before making that investment. Alite Cloverware 3 n 1 Utensil Set –$5.50. knife, spork, also extends to use for cooking. BPA free, dishwasher safe, boil safe. I’ll use this at work as well. Lighting Ever LED Headlamp–$7.50. I finally got a Head Light Lamp. I have been going to the REI members only garage sales hoping to find one of these in my price range, but these things are expensive there. Yes, I know, you get what you pay for! This has high reviews on Amazon, so I am hopeful that it will last for at least this trip. 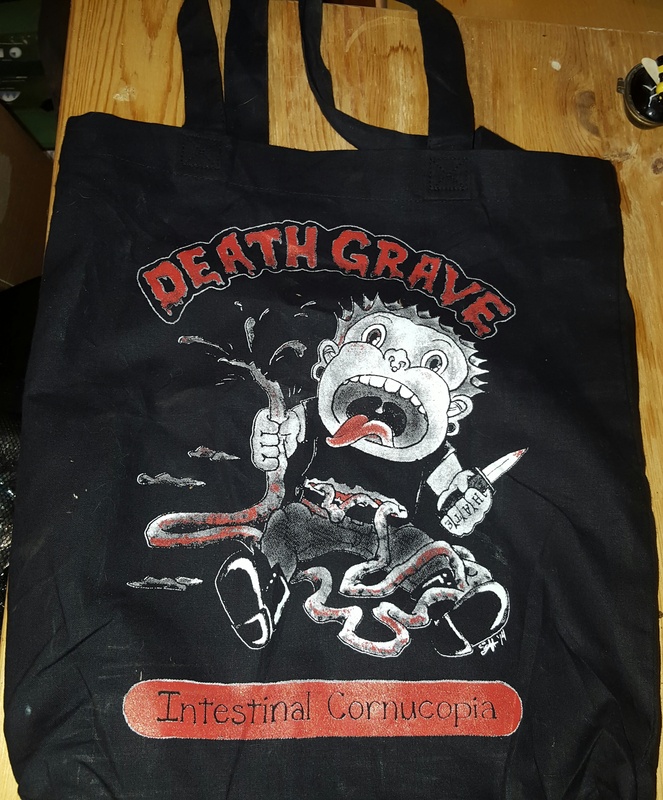 Oh and I’ll be keeping them in this fun little tote from a local band that I love called DeathgraVe! ← Chico thinks the tent is a doggy play palace!